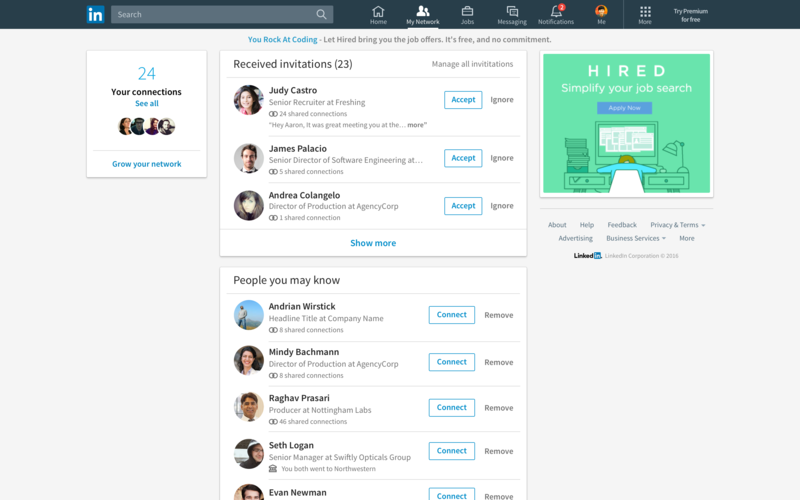 We announced last week that we have a desktop redesign on LinkedIn. Consistent with our mobile app and informed by feedback from hundreds of thousands of members worldwide, we’ve made an experience that is more intuitive, faster and creates more value for you. Most importantly, we want to help you more easily surface ideas, drive conversation and discover news and topics you care about. 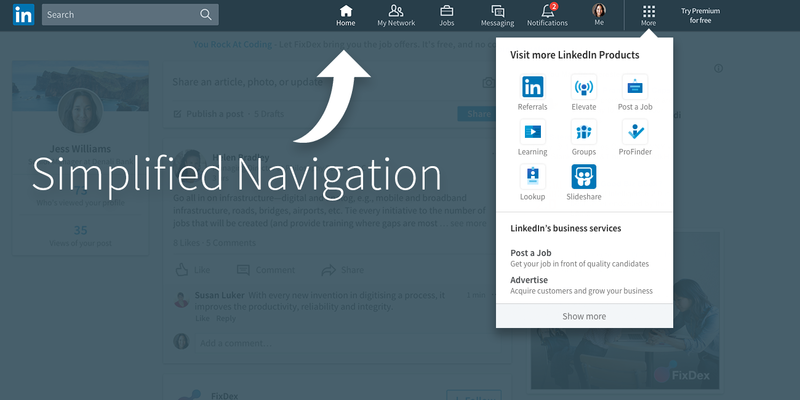 You’ll see that the navigation on desktop has been dramatically simplified to be consistent with mobile and bring focus to the core areas where LinkedIn can help you stay ahead. The navigation now consists of seven core areas -- Home (Your Feed), Messaging, Jobs, Notifications, Me (your profile and settings), My Network, and Search. With one simple click on the “More” icon on the navigation bar you can also now easily find and launch into other experiences that matter to you, like LinkedIn Groups, Lookup and LinkedIn Learning. Highlights: When looking at someone’s profiles, discover what you have in common in the new “Highlights” section. 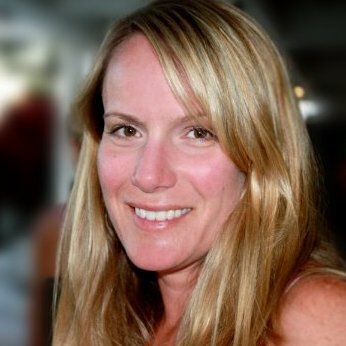 You may see mutual connections you have, companies you’ve both worked at, groups you’re both in or companies where they can help with an introduction. Suggested skills: We now show you suggested skills to add to your profile based on what’s most in demand by recruiters. People with at least five skills listed on their LinkedIn profile receive up to 17x more profile views, so it makes a difference. Views of your shares: Get details on who viewed your content by clicking on “Views of Your Share.” Then to look at who’s engaging with a particular post, click on views of your share at the bottom of that post. Here you will find a detailed breakdown of companies, job titles and locations of those who are engaging with your content. Coming soon, we’ll add in a profile meter with guided tips on what you need to update to look your best and get connected to opportunity. 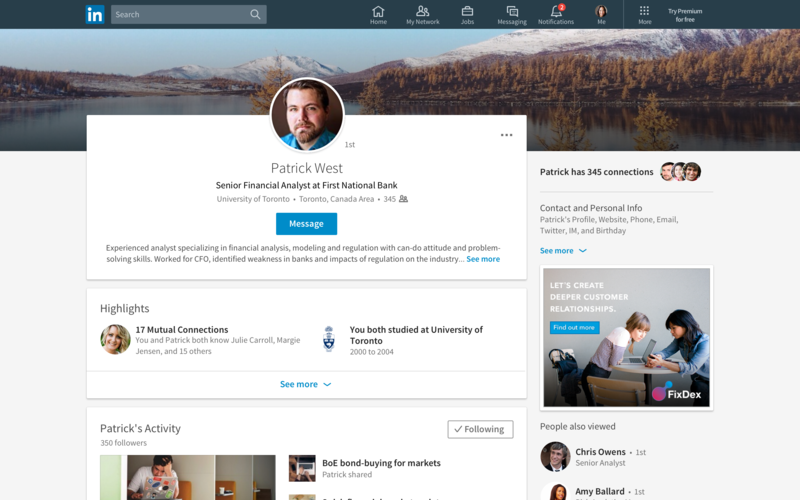 The connections you build on LinkedIn are important to growing your professional network and getting ahead in your career, so we’ve made it easier to manage by streamlining the My Network tab. Now you can easily see your connection invitations and discover other professionals you may know, and manage all invitations in one place. You can also see your full connection list on the left side. This is the first of a series of posts offering you tips on our desktop redesign to help you be more productive and successful. In the next few weeks, we’ll also share tips on editing your profile, using your notifications to keep connected and controlling your settings. We hope you’re enjoying the new desktop redesign.